Start making money with your laptop. A small Kindle purchase can make a difference when starting a home Internet business. I wished this little book had been available when I was trying to figure out how to make money online. Geez, I wasted $1000's of dollars purchasing the "secret to creating wealth on the Internet" from just about every lame guru, out there. Truthfully, none of it worked. I actually started doing well because I had some ability to write, and I just kept plugging away. 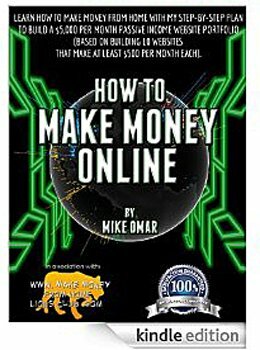 Mike Omar, author of How To Make Money Online, provides a candid and step-by-step plan to get you started earning money with your laptop. I particularly like Mike's premise on getting started with an online home business. He completely refutes the idea of GRQ (Get Rich Quick) when he says, "Generating an online passive income won’t happen overnight and takes a lot of hard work, but going through the process is completely worth it and having an exact plan of action is the best only way to ensure success. " However, the thing I like most about this inexpensive little book is that Mike delineates the exact same strategy I use to pull in $200 - $250 per day. I have 12 sites that only make make about $20 or so bucks each, everyday...but added together...they give me a lot of extra money to mess around with. Plus, I can donate/tithe half of that...and I still have a boatload of bucks to live the Florida beach lifestyle. Look, I know there are guys who make a tremendous amount of money on the Internet. I am NOT one of them...but, hey, would you turn up your nose at an extra $7,000 per month to supplement your pension? That figure works just fine for me...and it will be increasing each year. The great thing about having an online business is that you can work from just about anywhere...and when you make decent money, you can travel all you want...and write off almost every expense. You can work from beautiful National Parks, quaint little diners, harbors, yachts, and Rocky Mountain lodges. Both of my degrees are in Physical Education. I started out as an elementary gym teacher. I'm sure out of the hundreds of people who read this page each day, 75% of them have a higher IQ than me. I only wish Mike Omar's little book, and it's cheap price, had been around when I first started. It would have cut years off my learning curve, and I would have even more money for travel, concerts, and eating out. Before I go, I want to impress you with one important thought: Treat your business like a business. Above all else, keep in mind that you are NOT building a website...or a group of websites...you are building a business. I am continually amazed at all of the SBI owners who leave money on the table...their own money...because they do not see themselves as legitimate business owners, and refuse to take advantage of the tax deductions legally afforded to them. For reasons known only to themselves, they overpay their taxes by $5000 - $6000 dollars each and every year. Money that would help their own families goes to bureaucrats who will spend it without hesitation. 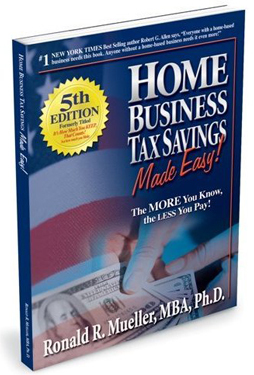 Do yourself a favor, and purchase Ron Mueller's Home Business Tax Savings Made Easy. 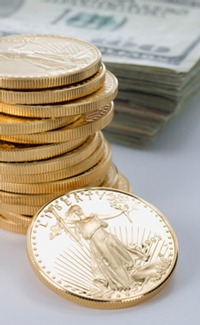 He is a Naval Academy graduate who has provided an exhaustive study of United States tax laws that protect small business owners, and put them into understandable terms so that you can keep more of your own money. This is one book that will open your eyes...and probably make your blood boil when you see all of the money you have overpaid by NOT having your own home business. Thank you for reading through this short article. I am not much different than you. I spent 32 years as a teacher, and retired from Peoria Unified School District in 2006. Since then, I have lived in beautiful St Petersburg, FL and have enjoy a leisurely and exciting life. It has all been enhanced by my online home business. I do not have any special technology training, nor any specific business acumen. Everything I have learned has been by trial and error...but now, you can overtake years of my frustrated learning experiences. A small Kindle purchase can make a difference...and fatten your wallet if you put in the hard work.